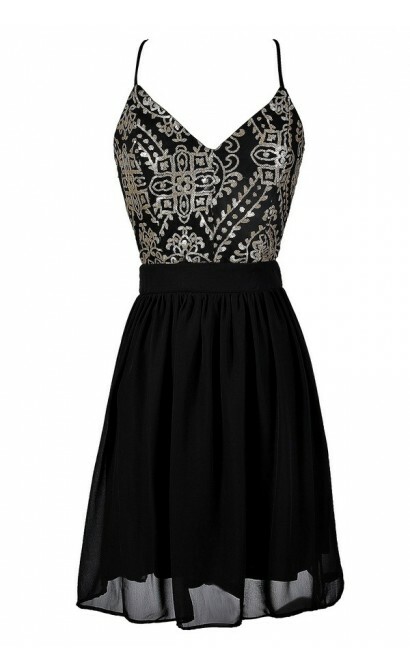 This flirty dress has an awesome open back design that is perfect for any upcoming party. The Gold Glimmer Open Back Chiffon and Sequin Dress is fully lined. It has a unique gold sequin design at the top. 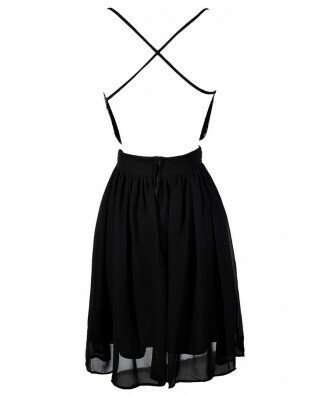 The attached skirt is made of chiffon and has a flowy cut we love. The attached spaghetti straps of this dress continue around to the back and crisscross, forming an X. A hidden back zipper completes this dress. The Gather Around Aqua Open Back Chiffon Dress would look great paired with black pumps or wedges for an upcoming party. Details: Made in USA. Fully lined. Hidden back zipper. 100% polyester. Hand wash cold or dry clean. Small measurements: Length from top of bust to hemline: 31". Bust: 32". You have added Gold Glimmer Open Back Chiffon and Sequin Dress into Wishlist. You have added Gold Glimmer Open Back Chiffon and Sequin Dress for Stock Notification. You have set Gold Glimmer Open Back Chiffon and Sequin Dress as a loved product. 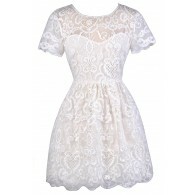 You have removed Gold Glimmer Open Back Chiffon and Sequin Dress as a loved product.